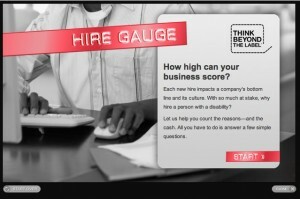 If you’re running a business – small, medium-sized or large – you should check out Think Beyond the Label’s Hire Gauge. I would argue it’s a must. Hire Gauge is the first-ever online tool to calculate the return on the investment (ROI) your organization can generate from hiring qualified workers with disabilities. For a typical large business, this can mean nearly $32,000 in tax credits, deductions and hiring cost savings – not to mention the additional benefits of diversity in the workplace, from employee morale and loyalty to the opportunity to tap new markets. All you need is two minutes (literally) to answer a short series of questions. Right before your eyes, Hire Gauge does the math on the results you can expect from your inclusive hiring initiatives. Right down to the dollar. Think Beyond the Label says they built this interactive “wizard” to guide executives interested in inclusive hiring strategies as well as hiring managers charged with recruiting diversity candidates. And it’s taking off. In its first two months alone, Hire Gauge was used more than 1,600 times. The PDF version was downloaded about 500 times. Clearly, it’s catching on; and I couldn’t resist checking it out. I run a small communications business in Connecticut. I road tested Hire Gauge to see how hiring a person with a disability would drive ROI for my firm. What I found was astounding: if I were to hire a person with a disability at a $40,000 annual salary, I would receive up to $32,400 in tax credits, deductions and recruitment savings. If I hired a veteran with a service-connected disability, that number jumps to $44,300. Cost-savings opportunities to the tune of thousands of dollars, resulting in significant ROI for hiring qualified workers with disabilities. The exact amount of savings will depend on various factors, including your company size, your inclusive hiring plans and in what state you source your candidates. When you complete your “test,” Hire Gauge provides links to all the resources behind your numbers. Hire Gauge outlines other benefits of hiring people with disabilities – including higher-than-average retention and attendance rates, as well as opportunities to tap into a new marketing segment with the purchasing power of more than $1 trillion a year. Not too shabby. If you’re running a business, Hire Gauge is a must. So try it now. You’ll be thankful later.